The Guard is solid evidence that a good script is still more entertaining than all of the special effects a major Hollywood blockbuster can afford. There is certainly action in The Guard, but the strength of the film lies in its words, and the skill with which they are spoken by the talented cast of actors. Much of the cast feels authentic, as though they aren’t actors at all but part of the background. This helps for the fish-out-of-water aspect of the film, one of many Hollywood story structures which are utilized within this clever buddy-cop crime comedy. 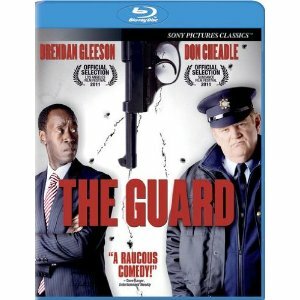 Gleeson is particularly amusing as an unorthodox lone Irish policeman who goes up against the rest of his police force and a group of drug traffickers with the help of a straitlaced FBI agent (Don Cheadle). They are an obvious mismatch in every way, but these two law enforcement officers are able to compliment in each other’s talents in taking down the corruption in the small Irish community. The film is filled with clever and nonsensical banter, in between action sequences and an unorthodox investigation. The Blu-ray special features include a group of outtakes which make the filming of the movie seem as much fun as the viewing. There are also deleted and extended scenes and a short film, “The Second Death.” The feature film has an optional commentary track with director John Michael McDonagh and actors Cheadle and Gleeson. Though the humor comes before the action, there are plenty of scenes in which the high definition made the viewing of The Guard more enjoyable, especially the 5.1 DTS-HD audio. My only problem was catching all of the jokes with in the quick repertoire, and eventually turned on the subtitles to get it all.